Advancing the frontier of underwater lighting, the Gates GT14 Underwater Imaging Light unites many practical features into a compact, travelable package. Up to 14,000 lumens of light into a wide, even 90° beam angle. A big, glove-sized Power Ring rotates through 5 light levels that include a very low scouting mode for night diving just enough to see, navigate and set up a shot. Fuel gauge and Light Level indicators are mirrored to provide a quick glance reading from either side. Water cooling contact just behind the LED arrays enables higher efficiencies for peak lumens output and longer burn times. Batteries are easily changed and charge in 3 hours. The Gates GT14 Light meets the demands of recreational divers to underwater cinematographers with untethered, powerful illumination. Backed by Gates distinguished support and warranty a hallmark of our commitment to your success. 14,000 lumens output, 5600K color temperature *and* 90 CRI (Color Rendition Index), providing a balanced daylight spectrum. Uniform 90° Effective Beam Angle with pleasant edge falloff covers the widest shots. Quick change batteries for zero downtime. 3 hour full charge time. 5 power levels. 30 minutes at full power, >10 hours in Scouting Mode. Innovative LED cooling technology means higher light output efficiencies and longer run times. Seal Check fitting (optional) to verify integrity *before* entering the water. Multiple safety features including physical lockout, safety timer lockout, and thermal overload shutdown. Mirrored Light Output and Fuel Gage indicators provide an at-a-glance reading from either side of the light. Filter mount (optional) for a custom color, diffusion or effect. The GT14s are by far the most powerful light for their size. Four of these lights can replace the tethered, surface supplied setup on my Gates DEEP ATOM 3D rig. They are wide, even and great color, too. Practical, functional, bulletproof I would expect nothing less from Gates. The GT14 is backed by Gates legendary service, support, and warranty. Reliable, durable, dependable since 1969. That's why customers say: Don't Take a Chance....Take a Gates! 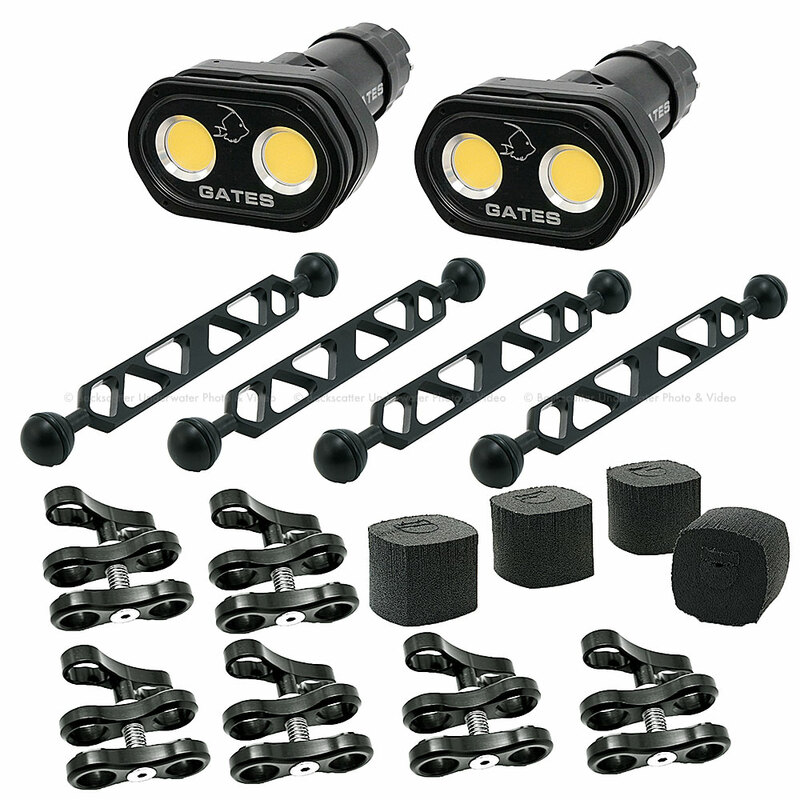 Advancing the frontier of underwater lighting, the Gates GT14 Underwater Imaging Light unites many practical features into a compact, travelable package. Up to 14,000 lumens of light into a wide, even 90° beam angle. A big, glove-sized Power Ring rotates through 7 light levels that include a very low scouting mode for night diving just enough to see, navigate and set up a shot. Fuel gauge and Light Level indicators are mirrored to provide a quick glance reading from either side. Water cooling contact just behind the LED arrays enables higher efficiencies for peak lumens output and longer burn times. Batteries are easily changed and charged in 3 hours. Powerful 14000 lumens from 2 LED Arrays. Durable, "Bulletproof" machined aluminum, black type III 'hard' anodize finish, and sealed with a nickel-acetate process. Safety features include physical lockout, safety timer lockout, and thermal overload shutdown. 5 power levels. Run times of 30 minutes at full power to over 10 hours at low power scouting mode. Innovative Water Cooling to the LED Arrays increase light output efficiencies and run times. Uniform and Powerful Effective Beam Angle covers the widest shots. 90° actual in water, >100° in the air. Mirrored Light Level and Fuel Gage indicators provide an at-a-glance reading from either side. Quick change batteries for zero downtime. 3-hour charge. Optional Seal Check fitting for surety of seal *before* entering the water. Gates Warranty and legendary service stand behind the GT14s. Construction: Machined Aluminum w/ Type III hard anodize & Nickel Acetate Seal. Stainless steel hardware. Seal Check fitting to verify integrity before entering the water. Filter Mount: Add any 52mm filter for custom color, diffusion or effect. Spare batteries for quick change between dives.